Is A Humidifier Good For Asthma? Is a humidifier good for asthma if you suffer from this common respiratory condition? Millions of people all across the country suffer from a relatively common condition that is known as asthma. Asthma is a condition where your airways can become inflamed, swell, and produce excess mucus at the slightest trigger. This makes it far more difficult to breathe and will often result in coughing, wheezing, or just a general shortness of breath. Of course, the severity of the symptoms will depend on the severity of the asthma. Similarly, the triggers that your asthma might have will vary from person to person. Some people are sensitive to things such as dust and smoke, whereas others hardly even notice their asthma on a daily basis. Having asthma can be a struggle, especially if one of your triggers happens to be something common, such as dust. This is one of the many reasons why people search for ways to improve comfort in everyday life. Thankfully, there are ways that you can reduce or even eliminate some of the symptoms of asthma when you are simply relaxing in the comfort of your own home. For example, there are some devices that people use to improve the quality of the air. Humidifiers are one of the most common devices of this type. As the name might suggest, a humidifier is a device that is designed to add moisture to the air, which will increase the humidity of the room. Many people use humidifiers for situations such as living in an area that has dry air; however, there are more and more people who are choosing to use humidifiers to reduce the severity of asthma. The question is, does it really work? Many people agree that humidifiers are wonderful for treating the severity of asthma, but before you can understand how this works, it is important to have a good understanding of how humidifiers work. There are several types of humidifiers, with each one working in its own specific manner. There are central humidifiers, which are usually built into your home’s heating/air conditioning system. These humidifiers are designed to humidify the entire house, rather than just a single room. If you are concerned about the temperature of a room becoming uncomfortably warm through the use of a humidifier, you don’t have to worry. There are a few humidifiers that are designed to produce a cool mist, rather than a warm one. Ultrasonic humidifiers spread the mist across the room through ultrasonic vibrations. Impeller humidifiers simply use a rotating disc to spread the cooled mist. Evaporators will use a fan that blows air through a filter, belt, or a wet wick to produce cool mist. Steam vaporizers are pretty similar to most humidifiers in the sense that it produces mist to humidify a room, but there are a few things to consider. These humidifiers will use electricity to create steam and then the steam is cooled before it leaves the machine. If you have young children or large dogs, this might not be the best type of humidifier for you, as the hot water inside of it can cause burns if it is spilled. With that being said, these are the most common types of humidifiers that you can choose from, with each one working in its own specific manner. What Should the Humidity Be? Before you can begin to manage the symptoms of your asthma through the use of a humidifier, you will first want to get a good idea of what the ideal humidity should be. Generally, you should make sure that you have a hygrometer in your room to measure the humidity levels. While they are similar in appearance to thermometers, their function is quite different. You should also consider making sure that your humidifier has a built-in hygrometer so that you can keep the humidity levels within the healthy range. The healthy range of humidity is between 30 and 50 percent. You should make sure that the humidity of your house always stays within this range, unless you want to deal with the side effects of improper humidity. Low humidity, or humidity levels under 30 percent, often presents itself through dry skin, irritated sinuses and throat, and itchy eyes. On the other hand, high humidity levels (ones over 50%) can make the air in your home feel stuffy. Not only is this uncomfortable for you, but it can also lead to a variety of problems, such as making it an ideal area for molds, bacteria, and dust to grow and collect. For people who suffer from asthma, this can be particularly bad, as molds and dust tend to be major triggers. By keeping the humidity at the proper level, you will soon be able to breathe more easily in the comfort of your own home. Asthma can be oversimplified to be point where it can be summarized as being far too sensitive to certain triggers, such as dust, mold, smoke, and so on. This means that when your respiratory system comes into contact with these triggers, it overreacts and begins to swell and/or produce more mucus than necessary, which eventually leads into having trouble breathing. Studies have shown that the quality of the air you breathe can have an effect on asthmatic symptoms. For instance, cold, dry air has been known to irritate the lungs, potentially causing an asthma attack. Warm, humid air will relax your lungs instead, which can allow more air to flow into your irritated airway, making it easier for you to breathe. This is how altering the humidity levels in a room can affect your asthmatic symptoms and potentially make it easier for you to carry on with life as you otherwise would. 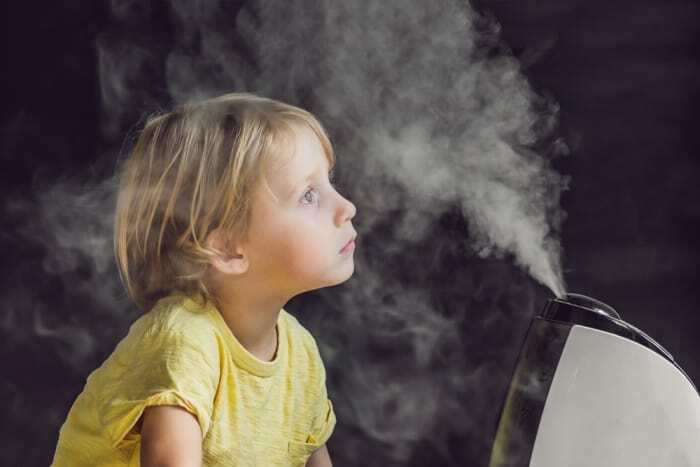 In fact, using a humidifier has been shown to be effective for both children and adults, meaning that no matter how old you are, you will be able to benefit from the effects of a humidifier. With that in mind, there are a few precautions you will have to take to ensure that your humidifier isn’t causing more harm than good. Once you make sure you have your humidifier set up, you won’t have to worry about it for a long, long time. What Should You Take Note of? As with using any new device in your home, there will be a few things that you should take note of. While low humidity levels can be bad, especially for people who suffer from asthma, humidity levels that are too high are arguably worse. When the humidity of a room is too high, it creates the perfect environment for dust and mold to form, which are two of the most common triggers for asthmatics. In fact, mold and dust are also common allergens, which means that they can cause double the trouble for someone who is both asthmatic and allergic to these things. This is just one of the many reasons you need to pay attention to just how humid your humidifier makes your room. Another thing that you will have to pay attention to is the placement of the humidifier. Because humidifiers work by adding moisture to the air, you will want to make sure that your humidifier is not located near curtains, drapes, or furniture. Likewise, you will also want to pay attention to how damp the floor beneath the humidifier becomes. By paying attention to these areas, you can make sure that there is no excess water on the floor, as this can end up growing mold. How Do You Clean a Humidifier? Something else that you need to be well aware of is the cleanliness of the humidifier. Because humidifiers need water to work, you will need to clean the humidifier regularly to ensure that you are not growing mold inside of it. Not only is the inside of a humidifier perfect for growing mold, but it is also a place where bacteria, allergens, and other problematic particles can grow if it is not well taken care of and cleaned out on a regular basis. Thankfully, it is fairly easy to clean out your humidifier. First, you will need to be familiar with the cleaning routine of your specific humidifiers. Some humidifiers, specifically ultrasonic and other cool mist humidifiers need to be cleaned out on a daily basis to ensure that the water does not stay stagnant for too long. Otherwise, you should clean your heater out every three days or so. You will want to make sure that you have distilled water, or water with a low mineral content, to refill the tank with, as well as a three percent hydrogen-peroxide solution to clean out the entire humidifier with. You will also want to have an absorbent towel with you as well, so that you can make sure that the humidifier is thoroughly dried out before you turn it on again. If you do not properly dry out the humidifier after cleaning it with a hydrogen-peroxide solution, you run the risk of making the harmful chemicals airborne the next time you turn it on. Nobody wants this to happen, especially when you already have a sensitive respiratory system. Something else that you can consider doing for your humidifier is getting filters that you can change regularly, as this can help with making sure that your humidifier stays as clean as possible. By following these steps, you can ensure that you will be as comfortable as possible within your own home, and you will be able to breathe more easily than ever. Can You Put Essential Oils In Humidifiers? How Long Do Air Conditioner AC Units Last?